Thus far in our series [Part 1 | Part 2], we have discussed how to properly plan for Ramadan. Now it is time to shift gears and focus on how to achieve the goals you have spent so long diligently designing! I have developed a 5-step solution to help you achieve your goals. 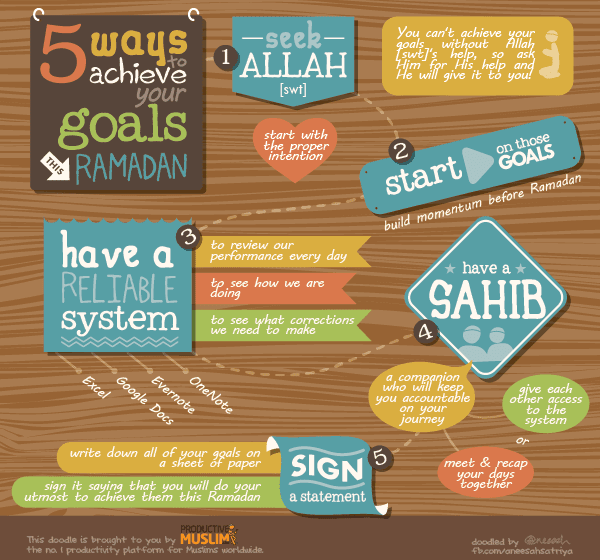 If you stick to them, these 5 S’s will help make this Ramadan your best ever, In sha Allah. No action can be successful without the will and aid of Allah , therefore for each and every goal you must start with the proper intention. You cannot achieve your goals without Allah’s help, so ask Him for His help and He will give it to you. Start with a humble admission that no matter how much effort you put into planning and execution, you are still in desperate need of Allah’s help. This admission will demonstrate to Allah what is in your heart and He will not return you empty-handed, In sha Allah. Do not wait until Ramadan to start working on achieving those goals. Once you have sought the help of Allah , there is nothing between you and success besides your own hesitation. 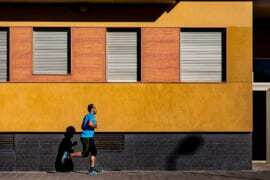 Now is the time to build momentum, even before Ramadan begins. Imagine running through quicksand and suddenly the quicksand disappears. You will suddenly start running incredibly quickly. In the same way, going for your goals before the start of Ramadan will give you a running start after the devils have been chained. 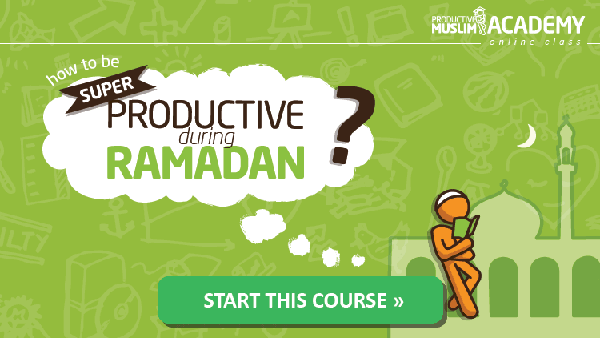 While others will just start making progress on the first day of Ramadan, you will already have a head start! The Prophet said: “The most beloved deed to Allah is the most regular and constant even though it were little” [Sahih al-Bukhari]. So start small and stay consistent to maximize your effectiveness this Ramadan. As the saying goes, “That which is measured improves.” All businesses have reliable systems to track and measure performance of key aspects of the company. In the same way, each one of us needs a system to review our performance every single day to see how we are doing and what corrections we need to make for the next day. In addition, I highly recommend tracking your progress and comparing yourself this week to yourself last week to see if you have improved or changed in any way. Sometimes, just because you know you will be forced to record the fact that you did not do your dua for the day (for example), you will do it. That may not be the perfect intention, but it is certainly better done than not! I personally use an Excel spreadsheet to track my performance and have done so for years. I can compare myself today to myself five years ago (believe me, it is not pretty!). But you do not need to make it too complicated. Any spreadsheet like Google Docs or even a journal like Evernote or OneNote would be very good at tracking your success. A sahib is a companion who will help you achieve your goals. Specifically, he is a companion whose sole purpose is to keep you accountable on your journey. He could be someone you agree to meet every night after taraweeh at the masjid. Each of you should recap your days together or, alternatively, give each other access to the system I mentioned above. That way, you keep each other accountable to a third party. 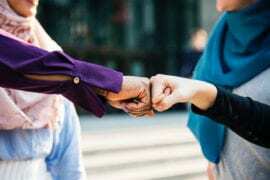 While other people are sharing gossip and chatting away, you are focusing on making each other’s Ramadan as productive as possible. What a dramatic difference one small decision can make! Last but certainly not least, write down all of your goals on a sheet of paper and sign a statement saying you will do your utmost to achieve these goals this Ramadan. There is something magical about putting your goals into writing as we discussed previously: Your mind begins to conspire to make these things a reality. There is no escaping the fact that these are your goals now. In fact, this contract should be witnessed by your sahib. Even more important than that, by putting it into writing, it is as if the contract was also witnessed by Allah and His angels. Doing this makes you part of a very special group of people: A group of people that is striving to have their most awesome Ramadan ever. I pray that Allah makes us all successful! Quickly decide on a way to record your progress. Identify a friend who will help keep you accountable. Print and sign your goals and post them prominently in your home and workplace. Now, I would like everyone to post below as you get started on and eventually complete the 5 S’s described above! Which one did you find most difficult to achieve? Which was the easiest? I’m interested to hear from you! This post was originally published on June 7, 2014.